Madrid - Real Madrid left-back Marcelo on Tuesday admitted defrauding the Spanish tax authorities of nearly half a million euros, according to a judicial source. 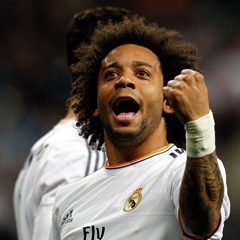 Brazilian international Marcelo admitted to tax fraud in court in Alcobendas, on the outskirts of Madrid, after being accused using front companies to hide €490,917 he earned from image rights in the 2013 financial year, a sum which he will now pay back. The Madrid vice-captain's admission of guilt is a first step in a deal he is trying to cut with Spanish prosecutors and officials. Once drafted, the prospective agreement will be presented to a judge. It will probably include a four-month suspended prison sentence and an additional fine equivalent to 40 percent of the sum he hid from the tax man. According to reports, Marcelo has used companies in Uruguay and the UK since 2006 to render his income from image rights "fiscally opaque". Marcelo's trial is part of the Spanish tax authorities' offensive on football, which has also caught the game's two biggest stars. In 2016, Leonardo Messi was fined €2.1 million and handed a 21-month prison sentence, later commuted to another fine, after he and his father were found guilty on three counts of tax fraud totalling €4.7 million. Marcelo's Real teammate Cristiano Ronaldo is accused of having evaded €14.7 million in tandem with his powerful agent Jorge Mendes, who is suspected of helping many of his clients defraud tax authorities.